Father’s Day is coming up and literally around the corner and I think this would be the perfect gift for that special dad. You must check out The Dancing Hot Dogs awesome Father’s Day giveaway that is happening right now! The Dancing Hot Dogs are giving away a Powermat valued at $99.99 (click here for more Powermat details)! 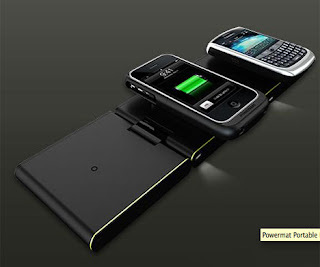 This Powermat will provide not only, organization of those pesky plugs and wires, but a sleek and chic way to power up and charge your I-phone, Blackberry, or other device supported by Powermat.